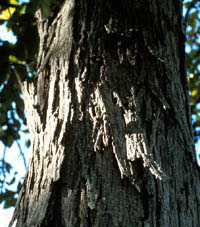 Shagbark hickory is easily identified by its bark, which breaks into strips up to 12" long by 8" wide with the ends bowing away from the trunk, giving it its shaggy appearance. It grows in rich woodlands, flats, slopes and hills of east Texas, where it is part of the pine-hardwood forest association of the Pineywoods. It usually occurs singly or in pairs but never in thickets. The nut is second only to the pecan in sweetness, and is cultivated commercially.